The TREK STORE of FARGO at SCHEELS is a different concept compared to any other SCHEELS bike shop. It has the same look and feel of the best TREK stores in the country, brought to you in a retail experience. This new concept was made possible by the guidance of TREK Bicycle and through our store development team. The concept store consists of a brand new look featuring an entrance from the southwest corner of the store and a broader selection of TREK bicycles and accessories. The new entrance will allow you to bring in your bike or any other piece of equipment that needs servicing with convenient access to the service counter as you enter. The modern look to the shop brings a whole new SCHEELS experience to the Fargo/Moorhead area that will make you feel like you are in a local specialty store. From experienced riders to first youth bikes, the new TREK Store offers something for everyone! The Precision Fit Studio is a specifically designed space to help customers get the most out of how their bike fits them. Through the use of a trained Fit Associate you can be custom fitted for rider performance, comfort and much more on a specific bike. Our trained Fit Associate can help any rider understand the benefits of the Precision Fit Studio and can customer fit the rider to their bike. The world’s most popular Trek bikes are at SCHEELS. Over the past 40 years Trek bicycles have been designed by hand in America with advanced-engineering materials pioneered by the Wisconsin company founded in 1976. Each Trek bike model is built completely by hand from the ground up. Trek’s patented Active Braking Pivot (ABP) system was designed to keep the rear suspension working when braking to avoid skidding. Trek engineered its famed Full Floater rear shock mount system for a better, more stable ride over mountain and trail terrain without the jolts that can occur with single-pivot suspension. Trek uses its patented OCLV (Optimum Compaction Low Void) carbon fiber process to craft its mountain, race, road and urban ride bicycles. Trek’s Alpha Aluminum process results in lightweight, strong rides in its bicycle styles for adults and children. Shop our collection of Trek performance and endurance race bikes, road bikes, fitness bikes, triathlon and cyclo-cross bicycles. Find a collection of Trek touring and adventure bikes, dual sport bikes, recreational bikes and Trek urban utility bikes at SCHEELS. The Townie is the perfect run-around-town bike for riding to the farmer’s market, grabbing a coffee or just rolling around the neighborhood. With an upright riding position that lets you see the world better and the ability to place your feet flat on the ground whenever you want, our townie collection sets the standard in comfort and control. Growing in popularity throughout the biking community are electric bikes. From fully motorized bikes to pedal assist options, finding unique ways to get more riders on the trail is the main purpose. TREK electric bikes, otherwise known as E-Bikes, are standard bikes with the added benefit of pedal-assist motors. These motors give an added boost to your own power to allow you to ride farther, faster and with less effort. These bikes are designed for all riders alike. Whether you are riding for a workout, commuting to work, pulling/hauling a heavy load or you are simply on a casual ride with a friend, these bikes are designed to make the ride more comfortable and enjoyable. A variety of styles are available from the casual Electra Townie Go! to a more rugged Trek Dual Sport+ E-Bike there is an option to fit your lifestyle. Bontrager, which is now owned by legendary cycling brand Trek, manufactures a huge selection of high-performance bicycle accessories, apparel and equipment to keep your cycling flawless. Whether you want to equip your bike with a wine bottle holder or need a comfortable new gel bicycle seat, Bontrager is a great choice. All Bontrager gear is designed for exceptional strength and low weight to keep you comfortable, safe and swift while on board. Outfit your bike with high-quality Bontrager parts, including bike handle grips and bike bells, from SCHEELS. Constructed from high-tech, high-quality materials that will thrive in the face of extreme cycling environments, Bontrager bike bags, baskets and beverage cages are perfect for everyone from leisure riders to professional cyclists. SCHEELS also carries quality Bontrager gear designed to keep you comfortable and deft during lengthy rides. A bike is far more complicated than two wheels and a frame. In fact, an average bike has more than 1500 individual parts. Because of this, our mechanics attend a Scheels-specific, ten-day course at the renowned Barnett Bicycle Institute in Colorado Springs, CO. There they receive classroom training as well as extensive hands-on, supervised instruction on bike assembly, maintenance, and repair. 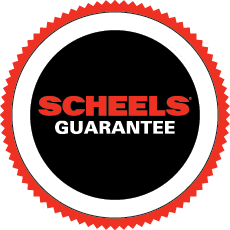 When you need bike service, trust Scheels Technicians to handle your bike as if it was their own. Before you head out on that bicycle trek, browse this huge selection of biking equipment and supplies at SCHEELS. There’s everything you need for an enjoyable, comfortable and safe ride, whether you’re tooling around the neighborhood, on a bicycling trip with friends or competing in a long distance race. You’ll find bicycles for all ages of riders, bike components, many different sizes and styles of helmets, riding gloves, bike accessories, lights and mirrors, bike apparel and footwear. There are also locks and chains, pumps, trailers and strollers, biking nutrition and hydration products. The bicycle selection is the best you’ll find anywhere, from beginner’s bicycles with training wheels for the young rider, all the way up to high performance Trek bikes and other racing models. With all the various components, you can build your custom machine for maximum power and a smooth, safe ride. The SCHEELS team is with you every step of the way, and their outdoor activity experts can assist you in finding just the right bike equipment for your requirements. Stop in and let us know what you think!